[Hexin Investment Gu Xiaoyu Hang: Rising back or lengthening the market adjustment time] For the fall of today's high, we think it is caused by technical factors and possible changes in capital or refined investment heads, due to the overall shock of the Shenzhen and Shanghai stock indexes since last Friday. There is a signal. According to the technical indicators of the weekly K line, the Shenzhen Chengzhi, which performed better after the Spring Festival, ended the weekly trend of Lianyang. 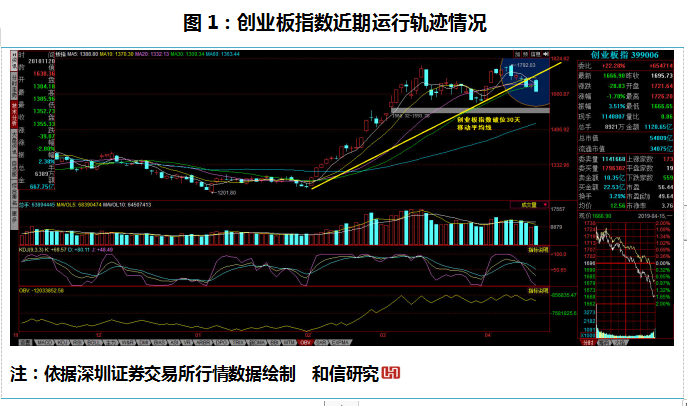 Last week, Shenzhen Chengzhi first closed the Yinxian line; the Shanghai Composite Index and the GEM weekly track trajected the weekly line in the negative; from the market In terms of important indicators, the energy tide indicator OBV has weakened signals, and today's adjustment is also reasonable. At the same time, multiple signals show that the bond market, the housing market and the science and technology and the GEM competition have emerged, so the future diversion of funds needs to be observed. On Monday, Shenzhen A-shares were affected by the central bank's data and export data. After the high opening, there was a trend of upswing. However, from the market response, only the banking sector performed strongly, but then there were multiple sectors down, eventually Shanghai and The Shenzhen market ended the day trading with a negative line. The Shanghai Composite Index closed at 3,177.79 points, and Shenzhen Chengzhi closed at 10053.76 points.GEMThe number closed at 1666.90 points, of which the GEM index led the decline by -1.70%. The total market turnover on that day was 775.778 billion yuan, and the market as a whole was the adjustment trend of the decline. From the perspective of price, quantity, time and space factors, if the subsequent amount can be weakened, the adjustment time of the market may be lengthened. For today's high retreat, we believe that it is caused by technical factors and possible changes in capital or refinement of investment heads, as there has been a signal from the overall shock of the Shenzhen and Shanghai stock indexes last Friday. According to the technical indicators of the weekly K line, the Shenzhen Chengzhi, which performed better after the Spring Festival, ended the weekly trend of Lianyang. Last week, Shenzhen Chengzhi first closed the Yinxian line; the Shanghai Composite Index and the GEM weekly track trajected the weekly line in the negative; from the market In terms of important indicators, the energy tide indicator OBV has weakened signals, and today's adjustment is also reasonable. At the same time, multiple signals show that the bond market, the housing market and the science and technology and the GEM competition have emerged, so the future diversion of funds needs to be observed. Tracking research and observation, after the Spring Festival, the Shanghai Composite Index and the Shenzhen Composite Index and the Growth Enterprise Market have continued to rise in terms of policies, but after entering this week, their technical indicators, especially the weekly technical indicators, continue to be purified at high levels, including Shenzhen Chengzhi this week. In the 15th week, the technical indicators were high in the 10th week, and KDJ in the stochastic technical indicators appeared overbought. Last week, there was a mid-week trend and a high-end dead fork, indicating that the market is expected to adjust the weekly technical indicators. Expand. Recently, our research found that the change of OBV index of technical factors is more critical, and it has a continuous weakening signal. Therefore, it is more important to observe the subsequent changes. If it continues to weaken, the market will likely fall back; otherwise, it can continue to maintain its strength, but If the amount is not good, the adjustment of the large stage (week technical indicators) should be prevented. As the current round of the upswing, the Shenzhen Stock Exchange, the Shanghai Composite Index and the Growth Enterprise Market all have multiple gaps below, so the impact of the gap pullback has a certain adjustment effect. Market capitalNet inflowIn terms of situation, the data of Oriental Fortune CHOICE shows: two cities on the same dayMain forceThe net outflow of funds was -295.68 billion yuan, basically the same as the previous day. Observed, since April, the net outflow of the main funds has been obvious. It shows that under the background of the index performance in the market stage, the reduction behavior is obvious and the quantity increases. For the profit of March's social welfare data and export value, we believe that it has certain favorable factors, but from the perspective of the overall market refinement, we believe that this bullish factor has reflected the rise of the stock index in March-April. Foreign capital pays attention to the bond market, the real estate development of the big city policy, and the competition of the science and technology board for the GEM. We believe that the possibility of social capital investment differentiation will increase, and it can be understood that the funds invested in the stock market will face multiple The challenge of level factors and competition, so the stage of uncertainty, its uncertainty increases. Overall, the fall in the A-shares of Shenzhen and Shanghai stocks on Monday was in line with the determination of technical adjustment and weakening of the energy tide. The study believes that the strength and weakness of the market can be closely related. If the quantity can match, the market can maintain strong or volatile. On the contrary, if the cooperation is limited or weak, the adjustment of short-term technical indicators and stage technical indicators will be reflected. If the cooperation can be weak, the probability that the market may enter the adjustment and fall back will increase, and the risk of individual stocks will increase. From the perspective of risk prevention, short-term annual reportPerformanceA company that is too bad may face downside risks to stock prices. From the perspective of investment strategy, for stable investors, closely observe the changes in market OBV indicators, and the short-term strategy should be the main focus; short-term investors are concerned about the variety of products, and the flexible use of market rhythm is more critical.